Lord Hanuman is a famous divine being because of two things – first, he is an incarnation of Lord Shiva, and secondly – he is known as the beloved devotee of Lord Rama. People who are under the influence of malefic planet like Saturn, Rahu & Ketu are advised to recite Sundarkand, a holy recital book dedicated to the Lord Hanuman perform chants Lord Hanuman Mantra on Saturday and Tuesday to rid you of the evil effects. Ruler Jai Hanuman Prayers holds exceptional importance as it fortifies the physical and mental improvement of the fans for the devotees. If Jai Hanuman Puja is performed under proper rituals as per the guidance of Pandith Ji, the likelihood of creating positive energy around you and your surroundings as well as bolstering your aplomb will be the notable benefits you attain. 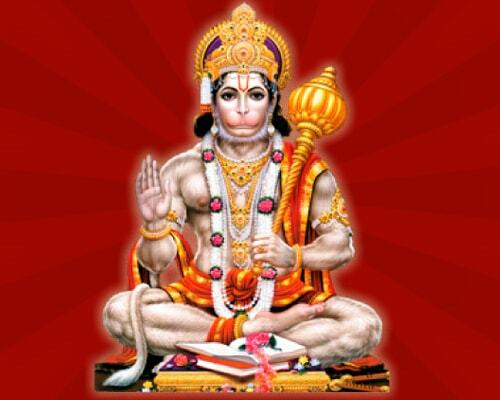 Jai Hanuman Puja can help you in getting rid of evil effects caused by malefic planetary transit in your horoscope. Astrology suggests that puja is performed in a pious manner, and devotee is supposed to be spiritually pure and use red vermillion, floral rosary, and Diya to please the god.